There are so many things I want to tell you about Yarn School so I am just going to start at the beginning and go from there. We flew from Louisville to Kansas City where we met several of our fellow Yarn Schoolers at the Jose Cuervo Tequileria in the airport while waiting for the shuttle bus that would take us to Harveyville. The shuttle ride to the school was two hours, but there was some miscommunication between our driver and the dispatch so it was actually closer to three hours before we arrived in Harveyville. When we got to the schools, we were given our room assignments and we all had assigned lockers filled with goodies. I had the chance to go exploring around the two schools and meet the students who weren't on the shuttle. Thursday's dinner was hor'dourves and cocktails. This is where I get to talk about the food. There was a professional chef doing residence at the Harveyville Project so the meals were nothing short of amazing. I was the only vegan in attendance so he made me special meals or additions to the meals when I couldn't eat certain things. I went expecting a weekend of pb&j (which was fine since I wasn't there to eat) and what I got were two amazing gourmet meals a day (plus breakfast which was continental style so I had a banana, a flax bar, and a glass of soymilk.) I am very impressed about how accommodating they were and I really appreciated it. After dinner there was a swap and shop where people sold and traded stuff from their stash or stuff they made. It was really fun and really cool to see the stuff that people had created. I sold some of my stuff and I traded for a ton of handmade goodness. Not only was the sun rising, but there was a full moon and it was still in the sky at sunrise. Friday was the dyeing day of the workshop. We dyed in the old high school chemistry lab so there were lots of sinks and outlets for the crackpots and microwaves. I dyed some roving and yarn I brought by actually measuring out the dyes instead of the freestyle method I usually use for dying. After a few hours of carding, I decided to spin some of my fiber up on one of the student wheels. All of the student wheels were different brands and different styles. The one I tried on Friday was the Louet S-17 wheel. Since I have only really spun on my wheel which is a double-treadle, I had a lot of trouble transitioning to a single treadle. Every time I stopped spinning, the wheel would go into the bottom position and I would start going backwards. It was very frustrating, but after about an hour or so on the wheel I started to feel more control. My first yarn on the Louet was way overspun since my method of control require spinning the wheel faster than I could draft. Finally, it was spinning day and the day I was looking forward to all weekend. I was still feeling a little wheel frustration, but then I was moved to the Fricke S-160 and everything suddenly started to look up. I was much more comfortable on this wheel and my spinning rapidly improved. I spun on the Fricke for several hours before giving it up (part of the fun of yarn school is getting to try a variety of wheels) and I really enjoyed spinning on it. 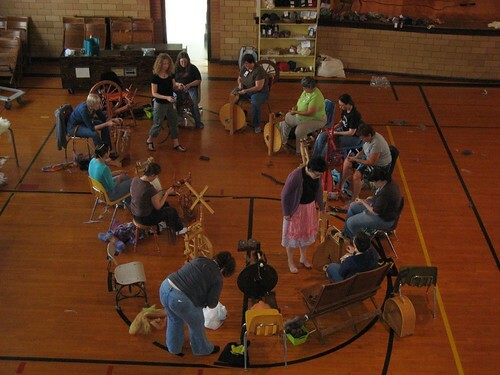 Adrian from Hello Yarn, Sarah from Maisy Day, and Jennifer from Whirled Yarn taught us all about the different wheel parts, models, and methods of spinning. I was in the beginner class since I am very much a beginner and I really benefited by learning (and relearning) everything from the beginning. We learned about Scottish tension and after a little experimenting with it I discovered that I prefer it to the double-drive system I have been using. I tried several other wheels including a few other Louet models, a Magicraft, a Lendrum, a Kromski some vintage mystery wheels, and two other Ashford wheels. I learned so much going from wheel to wheel and I feel like I have a much better understanding of what I need in a wheel and how wheels work. I am strongly considering buying a Fricke wheel for traveling (despite the name, the Traveler is not made for airline travel) which I will keep in the shop and take with me when I have to fly. We wrapped everything up. There were a few little workshops on specialty plying and creating novelty yarns. We talked about finishing our yarns and selling them. Then, we packed up our things and headed back to the airport. The shuttle back to the airport was much more pleasant and we all met at the Jose Cuervo Tequileria for drinks while we waited for our flights to depart. When we got to Louisville, Patrick took Zabet and me to Ramsi's where we had an incredible late-night meal. I got home very late and kept Philip up with memories of yarn school and thoughts of spinning. Awesome! I would have loved to have tried the dyeing and the different wheels. Maybe I can get to it next year. It sounds like you had an amazing time! I can't wait to see some of what you spin up in the near future. P.S. I'm coming to Lexington 19-21 of this month! That sounds fantastic, I'm so jealous ! Tell me, how was the Lendrum? I've put off getting a wheel for now, but I'm thinking of that for Christmas. I know which one you are. Interesting angle!! !